At Clarkdale Volkswagen, we love the VW Alltrack so much that last month, we decided to run an Alltrack photo caption contest. Mike and Stéphanie won! They were chosen to be Clarkdale’s Alltrack Whistler Weekend Adventurers this past weekend. 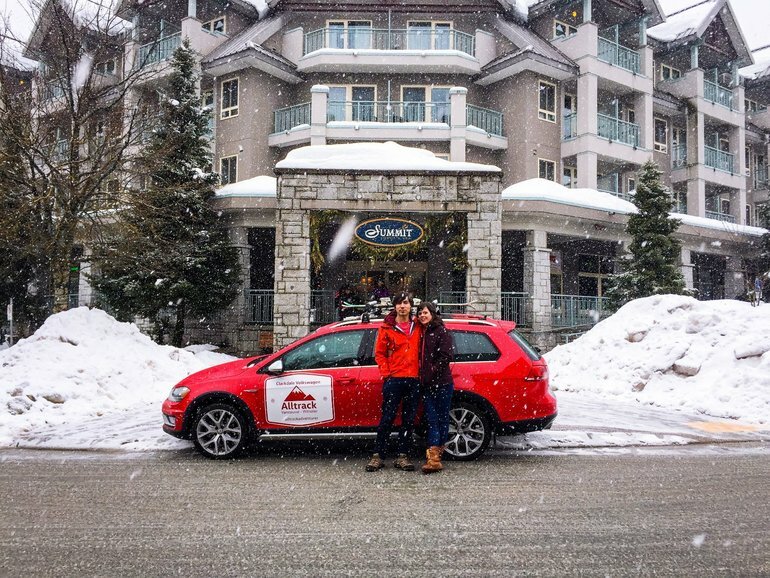 Their adventure involved picking up brand new VW Alltrack from Clarkdale on Friday afternoon, and then driving it up to Whistler for some on-the-house skiing and accommodation at Summit Lodge Boutique Hotel! Sounds pretty awesome, and according to the amazing photos and videos they took while they were there, it looked pretty awesome too. See below for what we’re talking about. Not only do Mike and Stéphanie have great taste in cars (their own car is a Golf Wagon), but they’re extremely talented to boot! As for the Alltrack, what can we say? With its 4Motion AWD system, athletic handling and extensive cargo room, what better vehicle to mount a Whistler Weekend Adventure with? No wonder it just won AJAC’s 2017 Canadian Car Of The Year and Best New Large Car! To learn more about the Alltrack or to take one for a drive and see what all the hype is about, visit this page.